Reminds me of a really wonderful documentary, Mickey Mouse Monopoly, done by one of the profs I worked with at Emerson College, Chyng Sun. It’s less about the copyright issues than the cultural hegemony of Disney, but it’s a brave example of fair use in the critical context, and the value and importance of defending fair use rights. Some 1,000 to 2,000 people have contributed code to Firefox, according to the Mozilla Foundation, which distributes the Firefox browser. An estimated 10,000 people act as testers for the program, and an estimated 80,000 help spread the word. 75 to 100 million people are using Firefox. I fall into the 75 to 100 million group. We need 500 more Introduction to Programming courses with some personality and some attitude. … When there are real choices out there (not “choices” between 17 clones that can’t be differentiated), then people will start finding OERs they like. This will lead to people reusing OERs. Problematically for the world of OER (like the world of open source), consumers who are “users-only” do not sustain projects. The entire point of OERs is to give them away for free. No one pays. People who find OERs and reuse them as is do not contribute to the health and growth of the project. Mozilla plans to make enough money to keep growing. But a windfall came in the form of a royalty contract with Google, which, like the other search companies, is always competing for better placement on browsers. Under the agreement, the Google search page is the default home page when a user first installs Firefox, and is the default in the search bar. In the last two years, the deal has brought in more than $100 million. … Thanks to the Google agreement, the Mozilla Foundation went from revenue of nearly $6 million in 2004 to more than $52 million the next year. Any significant aggregation of audience can definitely contribute to the sustainability of an open source project, and the same is also true for an OER project. Firefox could not be where it is today if the 2,000 contributors–or even 80,000 supporters–were the only ones using it. There’s a tension here in that OER have a natural tendency to be more narrowly useful, but sustainability and our intuitive sense of “success” both point to large audiences. I do think there will be some OER projects that find sustainability in big audience models, but if we are to create a movement that is addressing the broadest possible spectrum of needs, my suspicion is that we’ll need some good small audience sustainability models that can be widely replicated. …to the Louisville Free Public Library for making the OCW Consortium site their Spotlight Web Site. Thanks for the love. 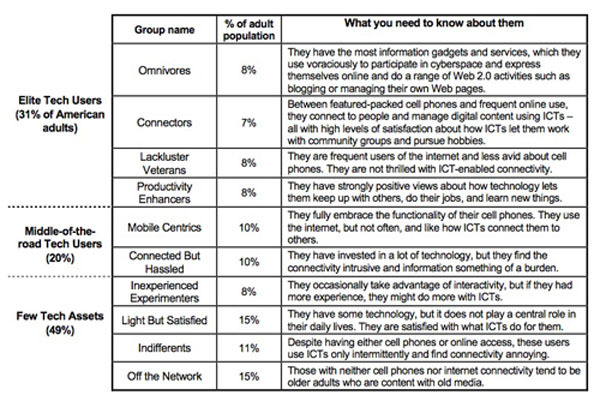 What is your ICT typology? I mentioned this in the previous post, but it deserves its own post. In conjunction with the recent OCW Consortium meeting, 10 Spanish schools launched OCWs containing a combined 120 courses through a Universia portal. This eclipses the number of Spanish translations they’ve done of MIT OCW materials and more importantly puts the focus on materials developed for the Spanish context. This is a tremendously exciting addition to the body of OCW content available worldwide. Just got back from the most recent OCW Consortium meeting, which was really a great event. 100 attendees from 16 different countries, with new OCW initiatives getting underway in Korea, Turkey, Taiwan, and other places–plus the launch of 10 Spanish OCW sites. Tremendous energy around the world, and very exciting to be a part of. One US school with strong alumni connections and relatively low operating costs is pursuing an alumni-funded endowment. Utah State University has successfully obtained funding from the Utah state legislature. UC Irvine is moving forward on a course-by-course basis, seeking out sponsors with connections to the subject materials. One example of this is the funding from Certified Financial Planner Board of Standards for their Fundamentals of Financial Planning course. MIT is exploring an NPR-style approach, with a mix of corporate sponsorships, visitor donations and revenue-generating mechanisms (such as links to Amazon that generate referral fees). I’m a little less clear on international models, but many seem to be supported by the institutions or funded by governments (as in the case of China, which now publishes more than 1,100 courses in Chinese through the CORE site. The takeaway for me? There is likely no silver bullet for sustainability, and models of sustainability are highly context-specific. I think this is good news–it means that like small businesses, OCW’s will have to find the business models that work for them. I’m sure there will be a number of models that turn out to be replicable with minor variations, but I don’t think it hurts the health of the movement to have a diversified funding base across projects. Some projects might fail to find a model that works, but it means overall the movement is less likely to collapse if a single source used by all projects were to dry up. Another 10K+ month for tOFP, with 11,085 visits last month. I’m actually a little surprised, as I’ve locked down tOFP forum and removed the Wilms Kids forum. Hasn’t seemed to affect traffic that much. 48 more downloads of tOFP [ Print ] went out the virtual door last month.